If you’ve been reading for awhile, you know I’ve been a fan of my Shoreline Converse for well over a year now. But the papyrus color I originally purchased sold out almost immediately and was never restocked. And I know that many of you, like me, were scared to get the white ones. But when Nordstrom asked me if I would talk about their selection of spring and summer shoes, I finally quit stalling and ordered the bright white ones for spring and summer. And let me tell ya, they’re good. Really good. So I got the shoes, and I immediately started scheming an outfit. I mean, I knew I would wear them like crazy with jeans and shorts, but I also loved the looks I’d been seeing all over Pinterest where the Converse were paired with dresses. I’d never done it before, but I always loved it when I saw others doing it! See my Pinterest board HERE for inspiration, and I promise you’ll want to pair Converse with a dress as well. 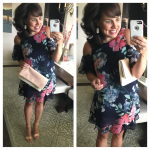 Sooooooooo……I had tried on THIS dress at Nordstrom several weeks ago, and I wanted to love it, but but the regular x-small was too fitted for a casual dress, and the regular small was too long and just baggy all over. I remembered the dress when I ordered the shoes, so I looked it up to see if they carried it online in petite, AND THEY DID! WooHoo! I threw it in my cart in a petite small and hoped for the best. AND Y’ALL. DRESS PERFECTION. Side note: since my legs are showing, I thought I would let you know that I’m using AND LOVING the tan towels. My sister told me about them years ago (she used to work at Nordstrom) and I remember using them then and really liking them! But then, for some reason (probably because they were cheaper), I tried several different lotions…but I never liked the results as much. So now, after seeing Shay talk about them as well, I’m back to using the towels. The color develops slowly over about a 4-5 hour period, and it’s very natural looking! I apply the color by wiping the towel in a circular motion over my entire body (usually right when I get out of the shower). When I’m done using a towel, I put it in a plastic baggie to keep the moisture in, and if I notice that I’ve missed a spot, I just go back and correct it with the same towel at a later time! For those of you that aren’t familiar with Shoreline Converse. Let me tell you why I like them so much more than my regular Converse. First, they are gathered across the back (which makes them comfy and easy to get on and off – you just slip them on and off like you would a flat!). Second, you don’t have to tie them! As you can see in the picture below, the laces are perfect just as they are! Finally, they don’t make your feet look as big as I think regular Converse make them look. Sizing on Shoreline Converse is a bit different than sizing on regular lace up Converse. People suggest to go down a whole size in regular Converse, which I found to be true. When I bought the papyrus color Shoreline, I bought my regular size at the advice of the salesperson. However, in these white ones, I found that I had to size down a 1/2 size. The website officially says they are true to size, but there are several reviewers (and several readers of mine who commented on Friday’s post) who said they had to size down a 1/2 size as well. Click HERE for the shoes. When I got my first pair, I went with the papyrus (a really dark khaki color) because I felt like the color was more year-round…..and because I felt like they wouldn’t show dirt very much. And I did (and do!) love them. But when I would put them on with my spring and summer outfits, the color seemed to pull the outfits down. I knew white would look great, and after hearing how easy they are to clean with a magic eraser, I decided to give them a whirl. The material is super soft, yet still manages to be substantial. And it’s not see through at all, so you wouldn’t even need to consider a slip. The dress is definitely thicker than a normal t-shirt, but it’s not stiff, it’s stretchy and comfy! 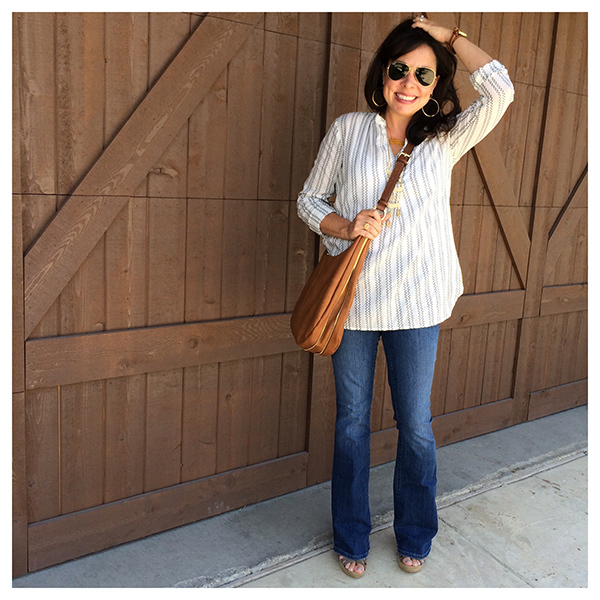 It is a great casual dress to just throw on, but still look completely put together. And it has pockets. COME ON! POCKETS! 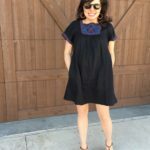 More Specific Sizing Information: I like my dresses short, but if you prefer a longer length and/or are 5’5″ or over, I would suggest getting the regular (not petite sizing). I’m usually a regular small, but I often buy petites in dresses and got a petite small in this one. The regular small was WAY to big on me, but the regular x-small was too fitted. And stripes get me just about every single dang time. And navy stripes? Well. I love them. You know what else these Converse would look good with? The racerback tank maxi I talked about a couple of weeks ago! They would also be cute with something like THIS plaid boyfriend shirt dress. And just one more shot of my shoes. Because they deserve a proper close up. 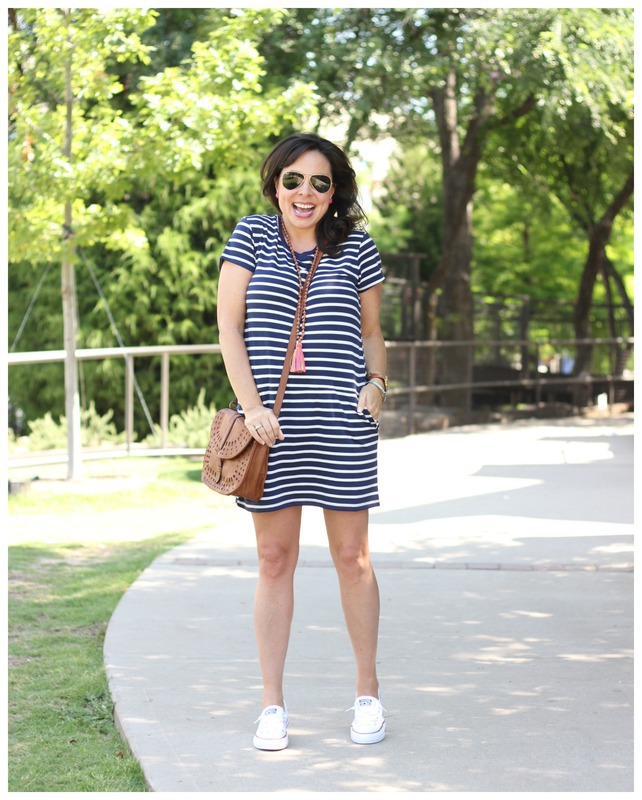 If you bought the the $34 dress from last month, try it with Converse! 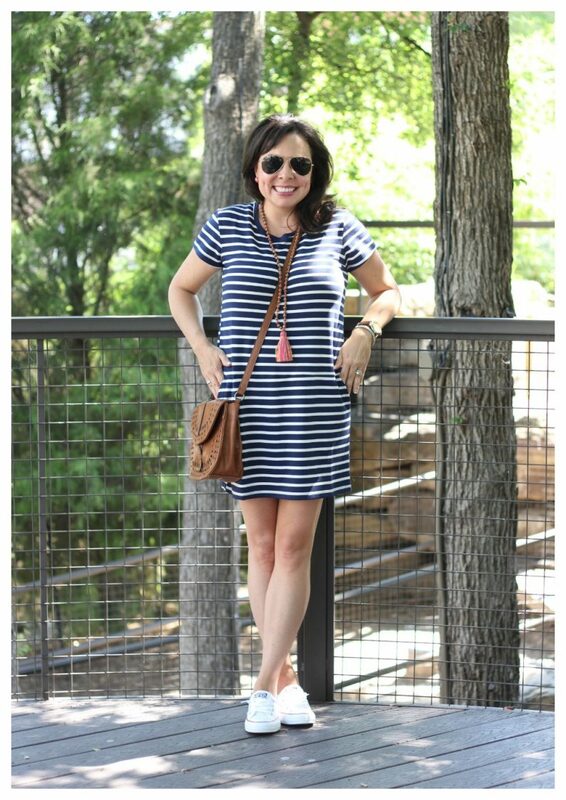 Click HERE if you want to see what other readers had to say about the dress on facebook (and to see a pic of me in the striped dress with a denim jacket and turquoise necklace!). At almost 5’4″, the small fits me best. 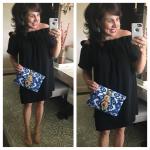 Click HERE if you want to see the post where I style the black dress 4 different ways! 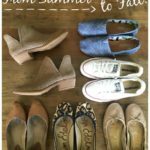 And since this is a Nordstrom spring and summer shoe post, the shoes below are all shoes that I personally own AND LOVE from Nordstrom. I’ve added them to my closet over the last 2 years or so, and they are all still available! I ONLY wear shoes if they are very comfy, so rest assured that all of them are. And look, the cork wedges are on SERIOUS SALE! One more thing, although I don’t personally own THESE neutral suede wedges (that just slip on! ), I adore them and think many of you will as well. Thank you to Nordstrom for sponsoring this post and to Cassie for grabbing the pics! See you girls back here on Wednesday! I got the shoreline converse for Christmas from my bestie thanks to your recommendation and love them. I find that I have to wear tiny socks with them to avoid blisters. Do you have any under converse sock recommendations? Thanks! I did go half a size down. Maybe I just need to wear them in. I will keep trying cause they are so cute! Converse makes “Made for Chucks” socks. I’ve seen them at Famous Footwear, DSW, and on Amazon. Hope this helps! I wear these with my converse and they’re perfect. Wow, thanks for the tips ladies! I purchased the shorelines over a month ago and have worn them numerous times. Dressed them up with the striped $34 dress for a day date with my hubs a week or so ago and received so many compliments! I just love how fitted they are compared to my regular chucks! Sporty Spice for real!! Loved your look! I bought the shoreline about 2 months ago. I wore them on a trip to San Fransisco where I walked approximately 10 miles for 3 days in a row. They are so comfortable for not being an athletic sneaker. I wear them with no show socks. The only thing I don’t like about them is trying to get them back to their new white state. 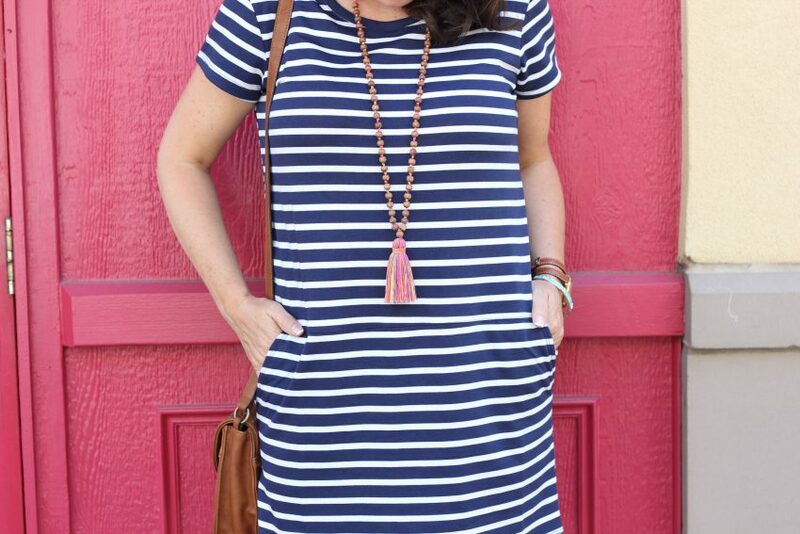 Any other stripe dress suggestions? I love the style of this one. This one is sold out in most sizes. Thanks! Tell your readers to scotch guard their white shoes it really works. You can buy a can of scotch guard at any store for a few dollars. I always do 3 coats (let each dry about 30 minutes) then spray them again. Your shoes will stay white for as long as you have them. I also always use a leather/suede protector (available at Nordstrom’s) on any colored shoes (3 coats again) and you will not get any dirt, stains, etc. Best way to ensure your shoes will last much longer and look new longer. 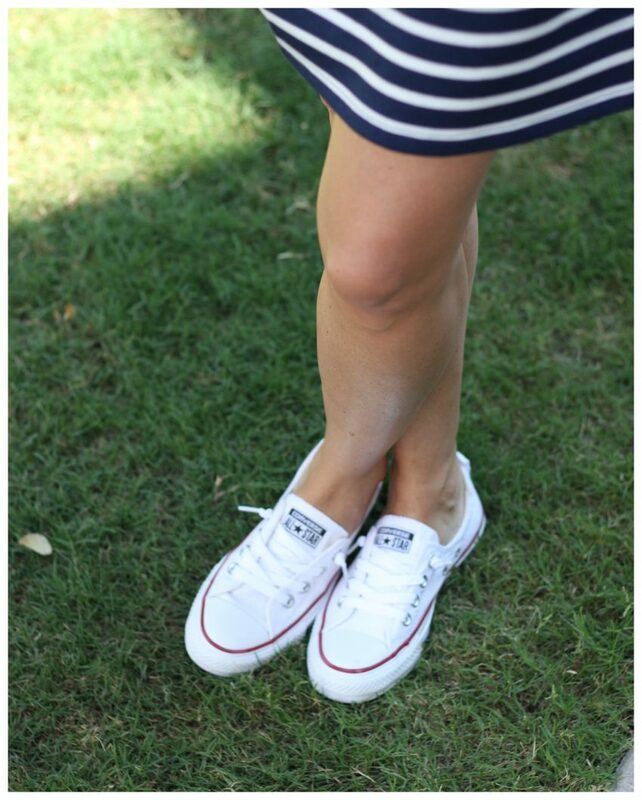 Samantha is right….always Scotchguard my shoes….any shoes as a matter of fact not just canvas. They make several kinds and that’s all I use because it seems to work better than others I’ve tried. I think they might have changed the sizing for the shorelines between some of last years colors and the current ones. I got some a couple of months ago (cloud gray) and when I read reviews for some of the older colors they said they consistently ran true to size, while reviews for the newer colors said to size down. I am normally a 7, but the 7 in these converse were way, way too big! I sized down to a 6 1/2 and they are perfect. The only issue I have with them is that they sometimes rub my high arches. I love them though! Perfect for when I am on the go with my kids, but want something cuter than regular sneakers. This is adorable! I’ve quietly followed for awhile, but I had to comment on this one. 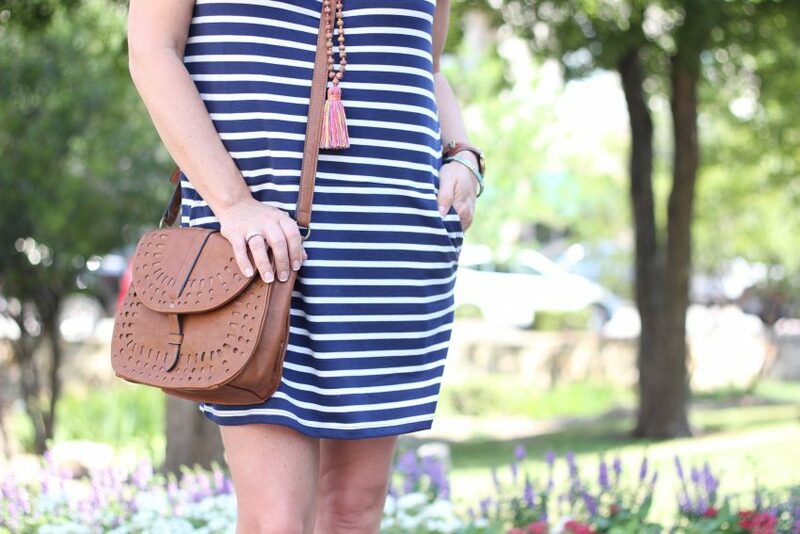 It’s a perfect summer outfit! You will get so much wear out of your white shorelines. I’ve had mine over a year and can’t tell you how many times I’ve worn them. I do want to add that I can’t wear them for long periods of time though. The elastic across the top starts really hurting after awhile, although they’re perfectly comfortable when I first put them on. I think I sized down, so that may be why. OMG!! 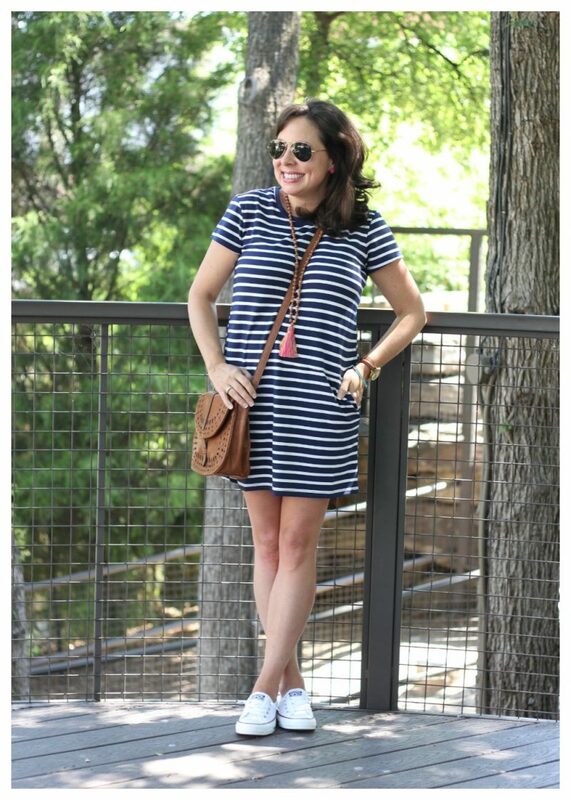 I wear a similar striped dress and my white shoreline converse about once a week lately. LOVE IT! And I did it before Sheaffer!! Go me! LOL LOVE your style! I love my white Shorelines! For anyone looking to clean them, I put mine in the washer and they came out looking fantastic! Please share your steps for washing your Shorelines in the washer? Any special detergent? Also, how do you clean them with a magic eraser? I have used a Magic Eraser on the rubber part of mine, but am needing to clean the cloth of the shoes now. I’ve had them since early spring. I literally tossed my shoes in the washer with my typical detergent (I use Tide pods) and set it to wash on my “normal” setting. They came out looking brand new and I just air dried them! Thank goodness you are here! I was stammering around with my coffee drink from blog to blog and everyone is gone!! I have a routine of reading and sippin’ and the vacationers are tripping me up!! I’ve filled my shopping basket up 5 times with the shoreline converse and always click on out, not today, I bought them today! I still love that purse!!! I saw it in one of your posts recently, and I like the cognac and the white!! Hmm… Might have to go for it! Shaeffer, you’re pretty awesome! Many mornings I check out outfits I’ve saved from you to Pinterest, and I’m good to go. Haha! I’ve recommend your site to younger friends and older friends. We ALL love you ? You’ve got a fan club here in CT!! I’ve definitely upped my game, thanks to you! Thnaks, lady ? 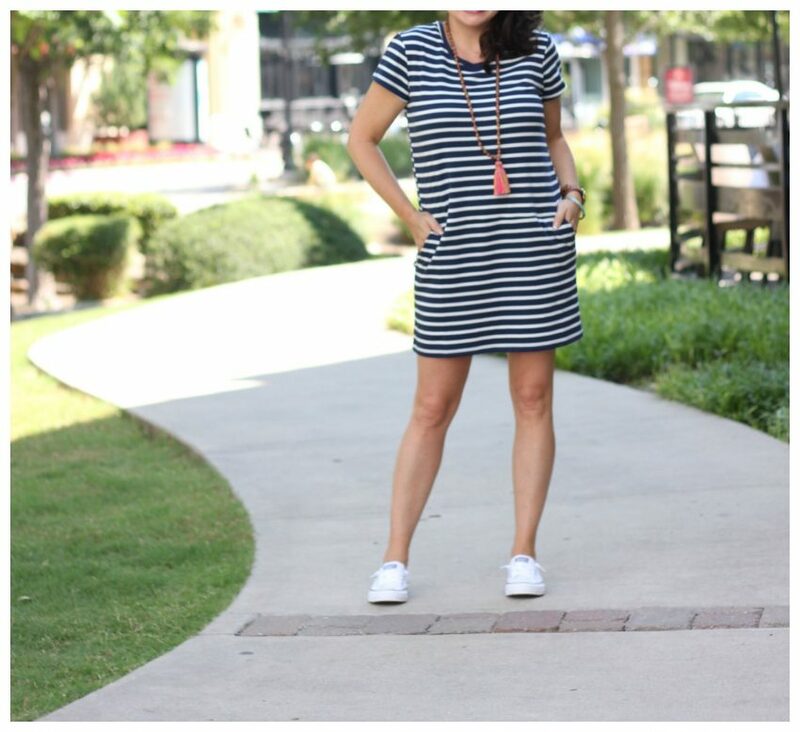 I have an almost identical navy & white striped dress that I wear with my light blue eyelet converse! It’s one of my favorite cute but casual/dressier than shorts outfits! It’s so comfy & like you said, it just makes me feel happy & good! Recently I told a friend that stripes (especially, since my wardrobe is probably 75% stripes, ha! ?) & polka dots are happy to me & that’s why I love them so much! The outfit looks great on you too! Love converse!! 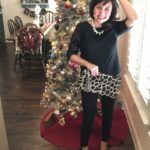 I wear my white, black, and gray all the time! Do you use the magic eraser on the white rubber parts? Hi! 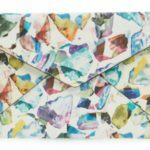 I am new to your blog and LOVE it. Thank you so much! After reading about the Shorelines, I ordered myself a pair but went with my true size and they are too big. I *should* have sized don 1/2 size as you/readers recommended, but I’m a size 10 and am just too used to shoes being tight so was apprehensive to do that. BUT now the stores near me (I’m in Canada) do not have the 9.5 Shorelines! 🙁 Major disappointment. Are there any similar styles to the Shoreline that you recommend? or can link us to? 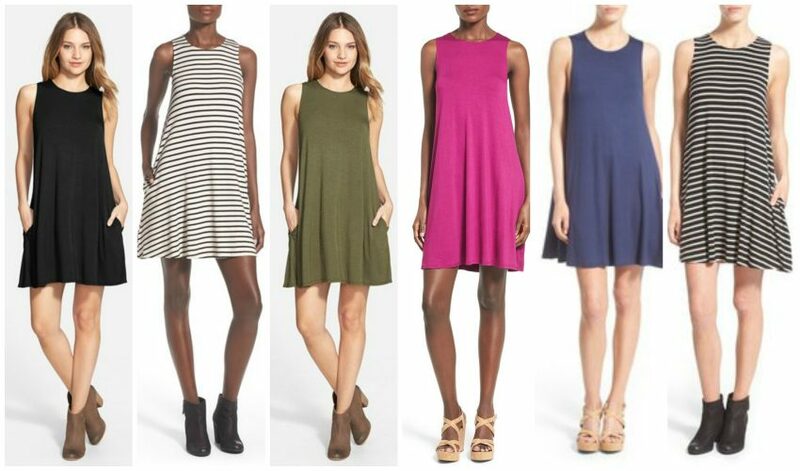 I love the look w the dresses for summer and was already planning many outfits. How do you lace your sneakers and leave the knots on each side?